With a Spiralizer, make wide zucchini ribbons. If you do not have a Spiralizer you can use a potato peeler, lengthways & peel ribbons off the zucchini. 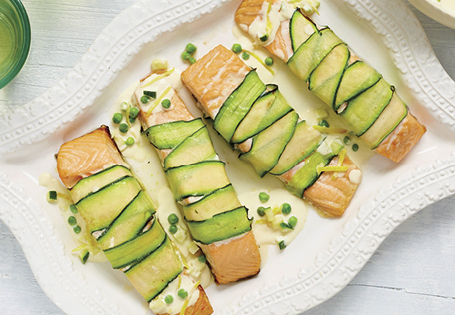 Wrap the zucchini ribbons around the salmon fillets, making sure the ends are underneath, then put the salmon into a baking dish. Chop any remaining zucchini up finely and put into a small saucepan.